Beloved Jesus, You are the Prince of Peace. It is You alone united with Our Blessed Mother, The Queen of Peace who can bring True Peace to the world. 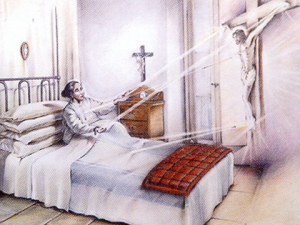 In Your great Love for The Little Daughter of the Divine Will, the Servant of God Luisa Piccarreta, You gave her the Power over Your Sacred Heart to draw You to herself and to do what she wants (V2 – 8.21.99). It is Luisa in whose Power is the Holy Will of God. (V6–7.14.04). You said “ask and we shall receive…,” and that “if two of you join your voices on earth to pray for anything whatever, it shall be granted you by My Father in Heaven”; and “where two or three are gathered in My Name, there I AM in their midst.” We beg You now with great confidence and hope in Your Holy Name, together with Our Blessed Mother, the Virgin Mary, and under the titles that you bestowed on Her and little mama Luisa please bring Your Peace to the world.